When your loved one becomes ill with sepsis, it can be a scary time – one that most people aren’t prepared for. You may not know what sepsis is or how to help your loved one. 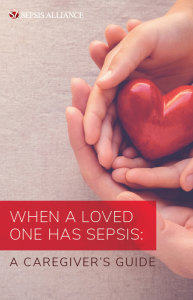 Scroll down for resources that may help you navigate this complex and difficult journey, including When a Loved One Has Sepsis: A Caregiver’s Guide. Sepsis is the body’s life-threatening response to an infection. To learn more, click here. What tests are used to help diagnose sepsis? There is no one test that can diagnose sepsis. Instead, doctors use a combination of blood tests to look for signs of infection and inflammation in the body, and to rule out other illnesses that could be causing their patient to be ill. To learn more, click here. The standard treatment for sepsis includes antibiotics and IV fluids, but treatments will depend on the individual. To learn more, click here. What can my loved one expect to face after sepsis? In the United States alone 1.4 million people survive sepsis each year. They may face life-changing physical, mental, and emotional challenges. To learn more, click here. Download our 2018 Sepsis Fact Sheet here.